The motor drives the drum through the friction clutch helical gear pair to make high speed rotation around the main axis. The feed liquid flows from the upper central feed pipe to the bottom of the drum and the direction of the diverter hole below the disc holder is toward the bowl wall. Under the action of the centrifugal force field, the solid matter which is heavier than the liquid sinks to the inner wall of the drum to form a sediment, which is manually removed after being shut down. Light liquid along the conical disc outside (on) cone to the axis of the upper part of the light flow to the heart pump, from the light liquid outlet. Heavy liquid along the disc (bottom) taper toward the drum wall, and then upward flow through the heavy liquid to the heart of the pump from heavy liquid discharge. Thereby separating the heavy liquid from the light liquid. Biodiesel is a kind of oxygen-containing, good lubricating performance, safe storage, transportation and use and has excellent explosion-proof clean fuels. It can be used as non-toxic and safe regenerative biological sources. 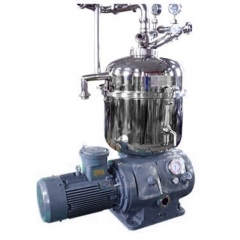 Biodiesel can be separated by centrifugal separation technology From vegetable oils and animal oils and waste oil and other raw materials to be. 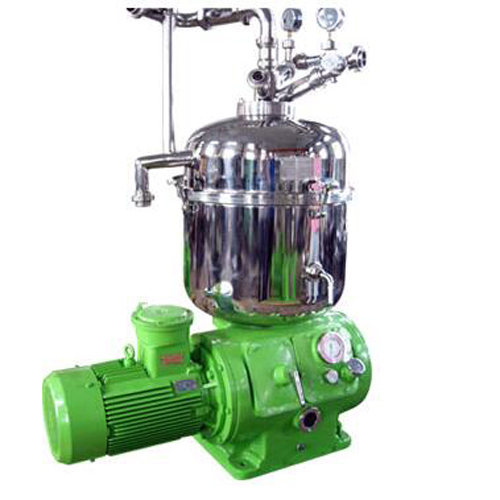 DRY 600 biodiesel separator is the use of international advanced biodiesel manufacturing separation technology, based on long-term practice through the design of the study. It is the only dedicated separation plant for biodiesel production. Production capacity: 10 cubic meter per hour.